Globalisation means for most people on this planet higher fences and less movement across borders. The new book by anthropologist Shahram Khosravi is an auto-ethnography of illegalised border crossing. This book is the outgrowth of my own ‘embodied experience of borders’, of ethnographic fieldwork among undocumented migrants between 2004 and 2008, and of teaching courses on irregular migration and the anthropology of borders. It also emerges from my activities outside academia: freelance journalism, helping arrange events such as film festivals about border crossing, and volunteer work for NGOs helping failed asylum seekers and undocumented migrants in Sweden. Auto-ethnography lets migrants contextualize their accounts of the experience of migrant illegality. It helps us explore abstract concepts of policy and law and translate them into cultural terms grounded in everyday life. In my years as an anthropologist, I have been astonished at how my informants’ experiences overlapped, confirmed, completed, and recalled my own experiences of borders. One interesting aspect of the auto-ethnographic text is that the distinction between ethnographer and ‘others’ is unclear. I haven’t found any reviews yet, but what I have found is a fascinating paper by him, published in Social Anthropology three years ago. 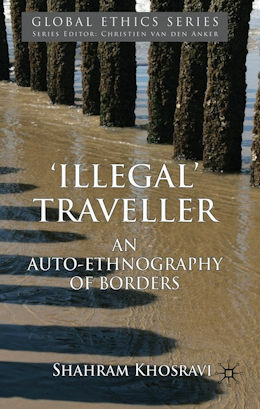 The title: The ‘illegal’ traveller: an auto-ethnography of borders (subscription required now open access!). Based on a capitalist-oriented and racial discriminating way of thinking, borders regulate movements of people. However, borders are also the space of defiance and resistance. It is because of this resistance he is still alive. In September 1986 he tried to leave Iran ‘illegally’ for the first time. “I had then just finished high school and I was called up to do military service during the ongoing terrible war between Iran and Iraq. To come back alive from the front was a chance I did not want to take", he writes. It was a long journey via Afghanistan, Pakistan and India. He ended up in Sweden via human smugglers. They saved him his life. According to immigration law, Homayoun was a human smuggler, a law breaker and a criminal. But in fact he saved my life in one of the most dangerous places, under the rule of ruthless criminal gangs, corrupt border guards and fanatic Mujaheddin. (…) Homayoun facilitated my escape from undesired martyrdom in a long and bloody war. Maybe one can say that the smugglers did what the UN Refugee Agency (UNHCR) was supposed to do? Khosravi tells shocking stories about the UNHCR who seems to be responsible for several deaths, including suicides, among refugees. Almost everyone in the refugee community had the same answer: “There is no point in going to the UNHCR". You won’t get any help. Khosravi’s application was rejected as well. In the view of the UNHCR officer, his “fear of being killed in a horrible war was not ‘well-grounded’ enough. Henry, a young Iranian-Armenian man (…) was an activist within a communist militia, Cherikhaye Fadai, in Iran. But the UNHCR did not believe him. The reason was a wall painting in a corridor in the basement of a prison in Isfahan, where Henry had been detained for several months before his escape to Pakistan. In the interview Henry was asked by the UNHCR official to say what was painted on the wall in the corridor, to test his reliability. Henry had not seen such a painting and consequently his application was rejected. How did the UNHCR officer know about the wall painting? How could she or he be sure that there was any painting at all in that corridor? Henry was desperate and did not know what to do. Just a few weeks before my departure from Karachi, one morning when the UNHCR officials arrived in their dark-windowed cars, he poured gasoline on himself and struck a match in front of the UNHCR. During my five months in New Delhi I shared rooms with many persons in transit. All are now residents of Europe or North America – thanks to the smugglers. He finally ended up in Sweden, a country that he at that time was not able to locate on a world map. The choice of destination was rarely as it was intended and designed. An ‘illegal’ journey is after all arbitrary. Sometimes the migrants end up in a country just coincidentally. First of all, the destination was determined by the payment. A few hundred dollars could change the destination from one continent to another. Masoud, a roommate, was Nour’s mosafer (client) at the same time as I was. He had US$500 more than me and today he is a Canadian citizen, lives in Toronto and his children’s mother tongue is English. I am a Swedish citizen, live in Stockholm and my children’s language is Swedish: US$500 destined our lives so differently. The border ritual reproduces the meaning and order of the state system. The border ritual is a secular and modern sort of divine sanctity with its own rite of sacrifice. Several hundred clandestine migrants die en route to Europe each year. From January 1993 to July 2007 the deaths of more than 8800 border-crossers were documented in Europe. The Mediterranean Sea is turned into a cemetery for the transgressive travellers. A legal journey is regarded as an honourable act in the spirit of globalism and cosmopolitanism. The legal traveller passes the border gloriously and enhances his or her social status, whereas the border transgressor is seen as anti-aesthetic and anti-ethical (they are called ‘illegal’ and are criminalised). We live in an era of ‘world apartheid’, according to which the border differentiates between individuals. While for some the border is a ‘surplus of rights’, for others it is a ‘color bar’ (Balibar 2002: 78–84). Khosravi ends his paper with some “final remarks” from 18 years later (2006), when he arrives at Bristol airport, along with colleagues from Stockholm University. He was convener for a workshop on ‘irregular migration in Europe’ at the biannual conference of the European Association of Social Anthropologists (EASA). After passing immigration control, I was stopped by a security official who let my blond fellow travellers pass. In the middle of a narrow corridor a mini interrogation began which lasted for half an hour. My status as a Swedish citizen disappeared at the border because of my face. I answered questions about myself, my education, work, purpose of visit to Bristol. Then she asked about my parents, where they lived and what they did. I was not willing to disclose to her any kind of information about my elderly parents, who have been subjected to persecution by the Iranian state for decades. When I refused to answer her questions about my parents, she threatened to detain me first for nine hours and then, if necessary, for nine days according to the Anti- Terrorism Act. I protested that she had targeted me because of my ‘Middle Eastern’ look and her selection of suspicious persons was racist. She did not even deny it and said ‘you [me and who else?] want to kill us. We have to protect ourselves’. For free migration: Open the borders! Research in refugee camps: Too political for anthropology?